During the course of a discussion on specific gameplay mechanics that could be used to define the challenge level of NPC opponents in a space combat game, one of the ideas involved eliminating NPC ships that don't perform well. That got me thinking -- how interesting would it be to work out a more-or-less evolutionary model for letting NPC opponents get better over time? What if NPC ships themselves could get better by repeated interactions? What follows is a first cut at a system for letting NPC ships "breed" themselves into combat excellence. It's not intended to be The Perfect Solution -- it's just some starter ideas to beat up on to see if the notion might have some merit. The first step is to define the "genes" of NPC ships. According to my naïve understanding, these would be fields enumerating the kinds of decisions that an NPC ship could make, where each decision mode could have several possible values corresponding to decisions of each kind. What other genes would be appropriate/useful/fun? The next step is to define the code that uses these genes to select the "fittest" NPC ships for future generations. Since NPC ships of different kinds will always need to actively exist in the gameworld, it's not possible to follow the usual GA approach of performing all genetic actions on the entire current population in clear-cut "generations." Instead, breeding new ships will have to occur in an asynchronous way, and the only way to determine the population's characteristics will be to take a snapshot at some arbitrary moment in time. randomly pick one gene of "ship"
Is 10,000 ships too small a number for a breeding pool given the number of fights with NPC ships that are likely in a normal gameplay session? What's the right number to create a fitness metric that leads to a satisfying rate for breeding better (not just different) ships? Should this number be one thing when the game starts, then change to something else later? Is a 5% mutation rate too high or too low? Should this number be one thing when a new game is started and change later? Would this system eventually lead to too few different types of ships? How long would it take to reach that point? How could this system be tweaked to avoid this problem? At what point should the breeding process be stopped? When will opponent ships be "good enough?" Could they ever become "too good?" Having considered just the core mechanics of an "opponent breeding program," it's also true that while a gameplay mechanic might be cool on its own merits, in an actual game it needs to be fun for anyone who's likely to experience it. So let's consider now some of the meta-level design possibilities for how to make a "ship-breeder" mechanic fun for most players who engage in ship combat. One way could be to impose a rule that new kinds of ships get created through breeding only 5% of the time. In other words, most of the time when the game needs to spawn a new hostile NPC ship, it can randomly instance a pre-defined ship of the appropriate tier, win/loss ratio, and (perhaps) type from the current table of ships. This would satisfy the usual "appropriate for your ability level" requirement for spawning opponents. Note, however, that this is still pretty simplistic. For one thing, it assumes that only one opponent is being spawned, rather than considering how multiple opponents could produce a desired challenge level. And it doesn't address at all the issue that spawning a new kind of ship through breeding might sometimes produce a ship that's either bizarrely stupid or unexpectedly clever -- that's a problem if one of the high-level design goals for challenges is that they always be close to the ability level of the player for whom those challenges are being spawned. Another possible issue with the ship-breeding mechanic is that it might be too good. Over a long time the population of "successful" ships currently stored in the ships table might become much larger than the number of average- or poor-performing ships. At that point the only "dumb" ships (i.e., really easy challenges) that players ever see would be the 5% spawned by genetic chance (and a small number of those might turn out to be really smart). So if most ships at various tiers/types are generally "smart" (in other words, good opponents at any challenge level), would that be a problem? Or a win? What other issues should be considered when thinking about how to actually include a genetic mechanic for breeding better opponents? I recently noticed an article by Mark Rosewater for Magic: The Gathering in which he discussed player types (or, as Rosewater calls them, psychographic profiles). ... Johnny wants to express something. To Johnny, Magic is an opportunity to show the world something about himself, be it how creative he is or how clever he is or how offbeat he is. As such, Johnny is very focused on the customizability of the game. Deck building isn't an aspect of the game to Johnny; it's the aspect. Spike plays to prove something, primarily to prove how good he is. You see, Spike sees the game as a mental challenge by which he can define and demonstrate his abilities. Spike gets his greatest joy from winning because his motivation is using the game to show what he is capable of. Anything less than success is a failure because that is the yardstick he is judging himself against. Reading the names and descriptions of these subgroups, I had that very familiar feeling of seeing another iteration on the four original player types proposed by Richard Bartle. Each of the four subgroups for all three MtG styles sounded very much like one of the Bartle types, simply zoomed in a bit to be specific to each of the MtG styles. As always, it's possible that I'm seeing just what I want to see here. But considering how very neatly each of the four subgroups for the Timmy, Johnny and Spike styles matched up with the four Bartle types (at least to my perception), I have to wonder whether Rosewater deliberately drew from the Bartle types to create the various subgroups. Whether he consciously adapted the Bartle types to his three-style psychographic model or not, I thought the juxtaposition of these models was interesting enough to be worth mentioning. 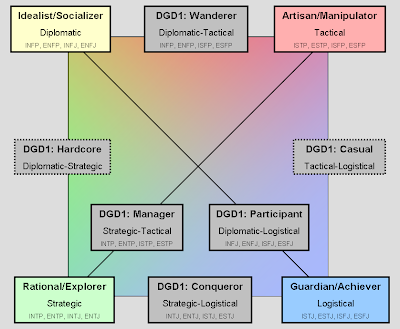 There are many styles of play for many kinds of games and gamers; I'm fascinated by the possibility that there might be some utility in recognizing four deep patterns of play in particular. Is Mark Rosewater's assessment of styles of play in Magic: The Gathering yet another confirming instance for this theory? Is There Now a Language of Game Design? Warren Spector and Will Wright observed that indie developers are exploring design avenues that are nearly impossible for older designers to have conceived, because younger indies are building on a lifelong fluency. "It’s like we developed this language we had to learn as non-native speakers," said Wright of his generation of designers. "They grew up with that language." "They're almost like commentary on the games that have come before," Spector offered. As I read it, this is the notion that today's game designers are inheriting (and fluently speaking as natives) an immediately usable language of gameplay mechanics that until now has had to be invented on the fly. 1. The "language" W.W. mentions seems to be more at the level of design patterns than the atomic-level game grammar that Raph Koster, among others, has been exploring. That's not to undercut the potential value of being able to reduce gameplay to low-level factors; it's more a recognition that the working language of a designer may usually be at the higher chunking level of patterns. 2. In terms of expressive capability and maturity, how does this game design language compare to the language of film direction? After a hundred years of movie-making, film directors today have a rich, specific, and broadly-understood vocabulary of verbs and nouns to work with -- how near or distant to that standard is today's language of game design? 3. How dependent on the computing, networking, and presentation technologies is the language of game design? Do non-computer games (such as tabletop RPGs) have useful "words" that today's computer game designers might not be aware of? Or is most of the utility of computer game design patterns driven by what the technology allows, in which case, what happens to a language of game design when the technology changes radically (as OnLive may do, which W.S. noted)? 4. As the flip side of the previous question, do some words in the language of game design ever die? That is, are there some game design patterns that are permanently abandoned? If so, why and how does that happen? 5. What's left to invent? Considered solely on its own merits, how complete is the current language of game design? Are there any obvious gaps; are there useful intentions and directions that are currently hard to communicate even between experienced designers? 6. Can new words in the functional language of game design simply be made up through conversation or general writing? Or must each new word prove its utility by being implemented in a game or games? Does the popularity of a game have anything to do with whether a new game design word is perceived to have enough value to enter the lexicon? Should it? 7. To put the above question in a different context, who invents new words in the language of game design? Game designers? Or non-designing game players?